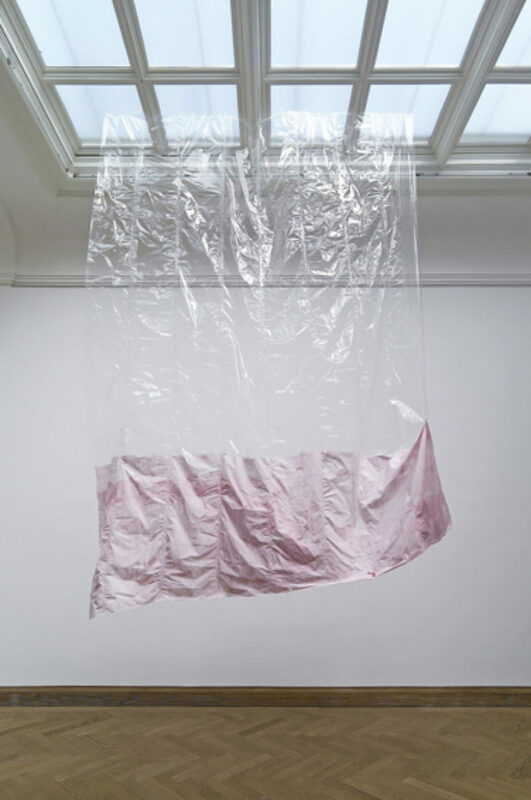 Having just seen the big Louise Bourgeois show at Tate Modern, it was hard to see Karla Black’s recent London exhibition (at IBID Projects) without thinking of the elder artist’s much quoted dictum, ‘For me, sculpture is the body’. Now, what this means for Bourgeois is not on the face of it hard to comprehend. Her work is filled with images of the body, or at least of some of its most symbolically-charged parts: breasts and penises, most obviously, but also hands and legs—and in recent years she’s been representing the figure as an entirety more and more. 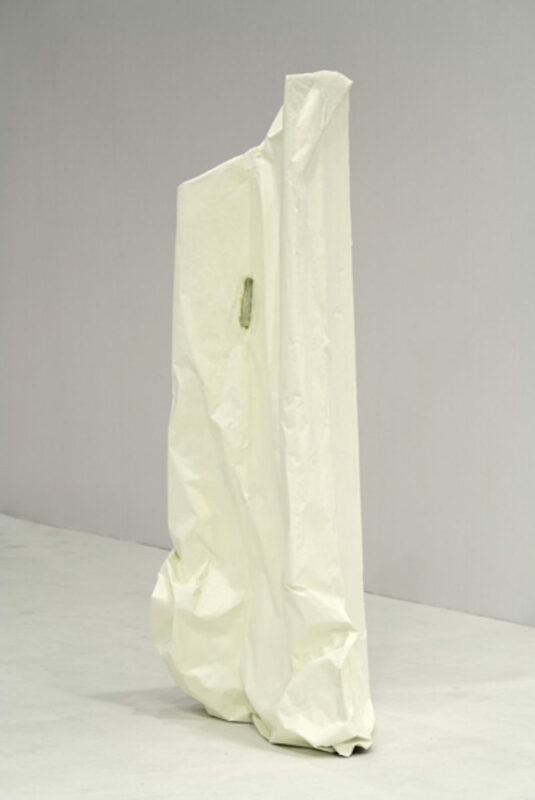 Karla Black’s sculpture is not like that at all. No organs, no bodies—and precious little of the pathos, symbolism, or melodrama that, with Bourgeois anyway, inevitably seem to go with them. Looking at Black’s sculpture, one sees, rather—what? The forms are not to be named, and perhaps only provisional. Not organic, and far from geometrical, they look like the results of some unpredictable intersection of will and process, gravitational subsidence and subjective energy. 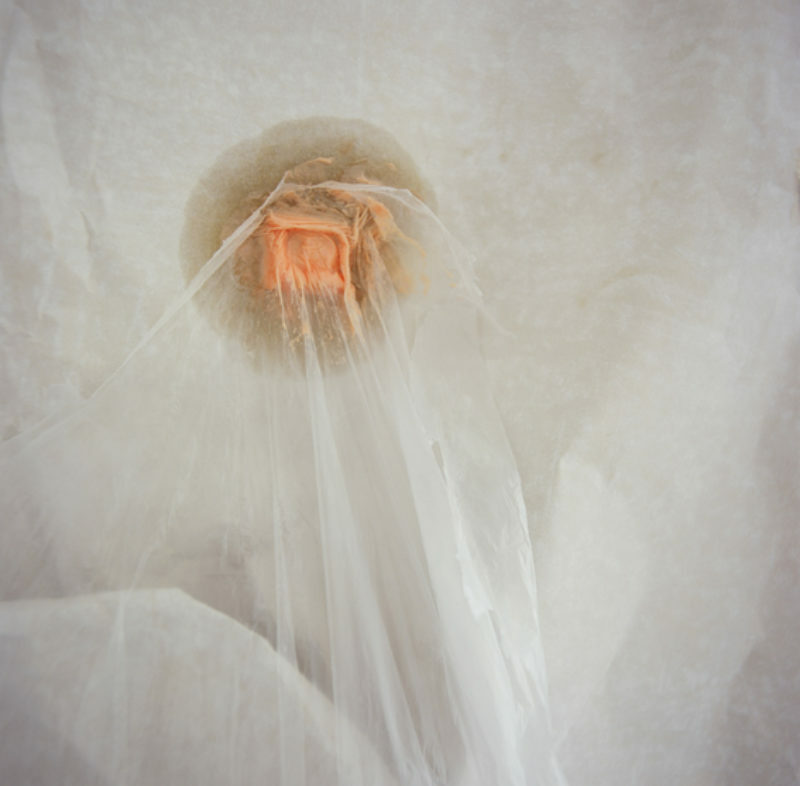 The materials, in which these forms are embodied in some seemingly makeshift way, are for the most part common, inexpensive, and fragile: plaster, cardboard, glass, plastic and paper for instance. articulated constructions, I do imagine their maker saying something like, ‘For me, sculpture is the body’—and, heretical though it may be to say so, with greater justice than in the case of Bourgeois. Because to my mind, anyway, the body means above all the felt body, the proprioceptive body, which is perhaps the body that knows the feeling of existence, the subject of what Daniel Heller-Roazen, in a challenging recent book, called ‘the inner touch’—and not so much the body that is seen, that functions as a shameful or seductive image for the eye of another. And it is of this felt rather than seen body that I am so vividly reminded by Black’s non-imagistic sculpture. 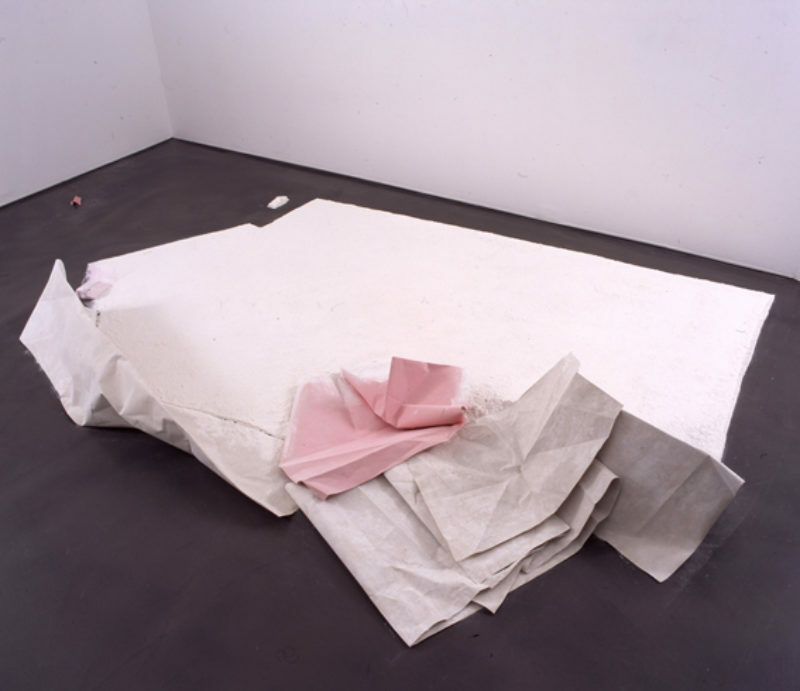 In retrospect, Lucy Lippard’s attempt in 1966 to bring Bourgeois into the fold of ‘eccentric abstraction’ along with other postminimalist sculptors like Eva Hesse, Richard Tuttle and Bruce Nauman—however heroic as a credible effort to secure legitimation for a recalcitrant and idiosyncratic woman artist at a time when this was hardly an easy thing to do—has been entirely contradicted by Bourgeois’s subsequent development, which has revealed her to be ever more deeply entrenched in the tradition of surrealism, which Lippard described as being based on a ‘reconciliation of two very distant realities whose relationship is grasped solely by the mind’, rather than, as she claims to be the case with eccentric abstraction, on concrete sense data free of ‘emotional interference and literary pictorial associations’ thanks to which ‘too much free association on the viewer’s part is combated by formal understatement, which stresses non-verbal response’. In contrast to so much other sculpture being produced today, which follows Bourgeois in seeking emblematic juxtapositions that are more to be recognised than felt, Black’s sculpture remains true to Lippard’s original insight, which has been insufficiently developed, that beyond surrealism and minimalism, there is another sculptural body in which material sensations can come to the fore in a way that escapes the rhetorical dichotomies of form and content, subjectivity and objectivity. It is this eccentric body, neither autobiographical nor fictive, that Black seems bent on figuring. From what I’ve said so far—from my emphasis on materials, and material sensations, as the substance of Black’s work—it might be imagined that this work also includes the idea of truth to materials, that the plaster or cardboard or glass or plastic or paper from which she develops her forms appear just thus, as they are found, without any further modification than their shaping. 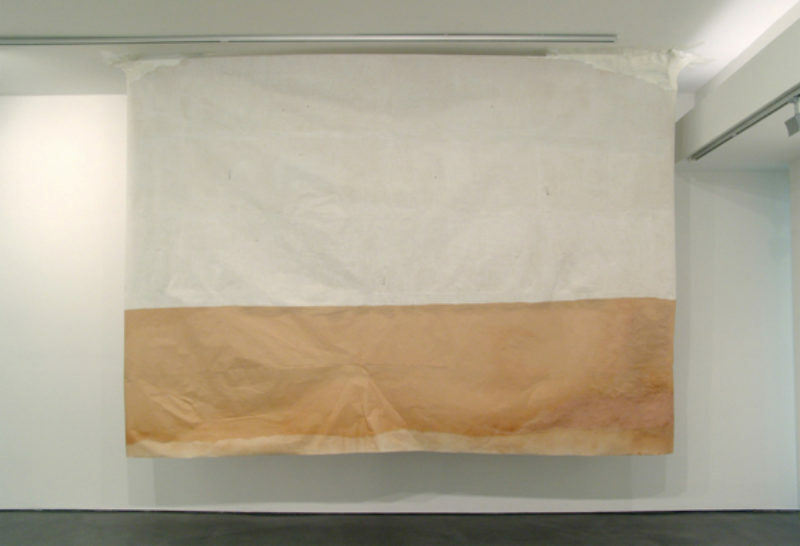 And on first glance one might not be disabused of this notion, especially in that there might seem to be little or no applied color, the cardboard being the brown of cardboard, the plaster the white of plaster and so on—the tautology of self-representation. 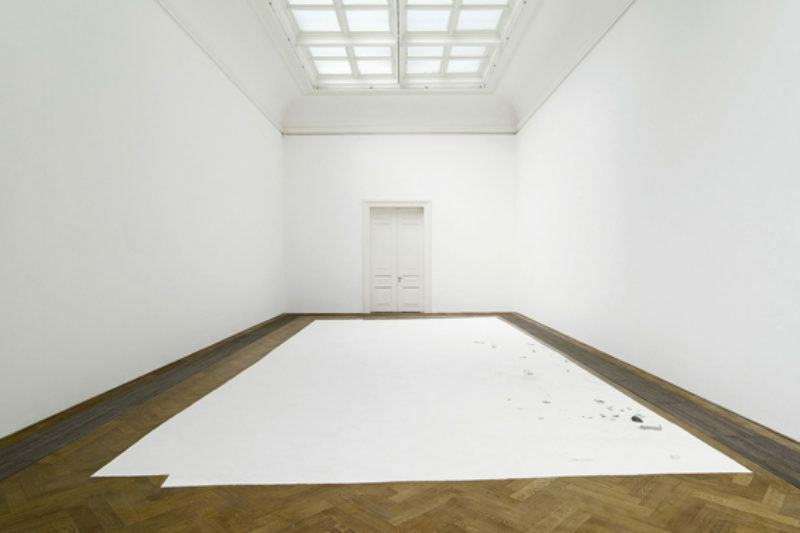 Yes, one might note that paint is occasionally used, but always in a literal way, as a material that (in this work only ever partly) covers a surface, not for its representational properties. 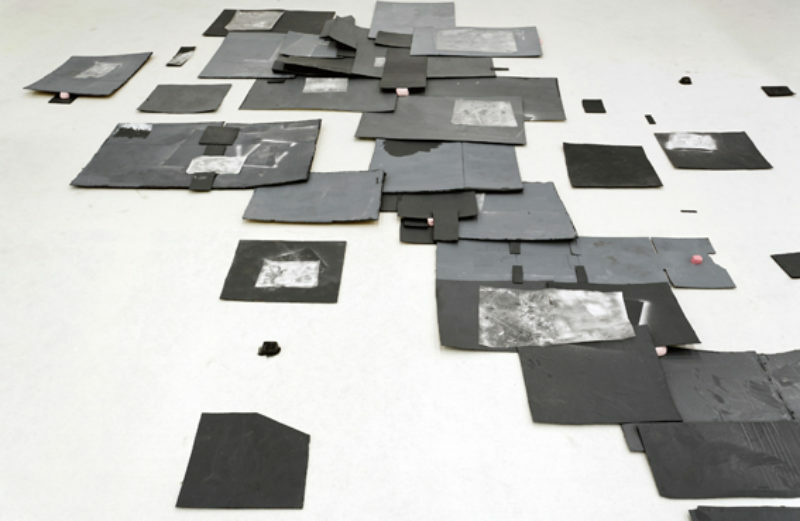 But it takes only a second glance to realise that it is not quite the case that Black’s materials manifest themselves in some pure and unsullied way. Far from it, in fact. And here’s where the notion that for her, ‘sculpture is the body’ takes on a discreet semiotic charge that the Lippard of 1966 might not have foreseen—or that, at least in a text structured by a distinction from surrealism, she had to suppress for the sake of polemical clarity. The eccentric body, it turns out, is not only ‘felt or sensed’ (in Lippard’s words), though it is pre-eminently that, but also ‘read or interpreted’. This semiotic supplement comes into the work, though—and here one begins to get a clue to the procedural scrupulousness of an oeuvre that might seem, and for that matter might well be, entirely intuitive—by means of a material supplement: to a great extent the appearance of Black’s structural materials had been nuanced by the judicious application of other substances, such as (in the case of her sculpture ‘Once Cut’, 2007, which was included in the group show Poor Thing at the Kunsthalle Basel last summer) petroleum jelly, eye shadow, nail varnish, toothpaste, vitamin E body cream, and diprobase cream—that is, substances normally applied to the body, for instance as cleansers or cosmetics—some of them specifically sold as ‘feminine’, some of them not, but all, Black emphasised when I spoke to her, ‘things I use myself, on my body’. This sculpture wears makeup. And that tells you something: It is not all about truth to materials, the congruence of appearance and essence, purity, austerity, or anything of the sort. This sculpture does not reject illusion or eschew seduction. Nor, for that matter, does it have nothing to do with painting. Perhaps even more surprisingly, neither is this work unrelated to performance. This is not to say that Black herself works as a performer—given her unwillingness to meet with me while she was installing her work (or perhaps it would be more accurate to say, rather, making her work) at IBID Projects, I’d guess that the idea of working in public makes her downright uncomfortable. But there is a temporal element to the sculpture that comes close to the performative. Because, while this work accepts illusion, the impression it gives of being fragile, provisional, makeshift is not illusory. To reinstall one of these pieces would to a great extent mean to remake it—therefore to reinterpret it. And furthermore, since the materials are in themselves volatile, unstable, one might say that the sculpture is always in the process of remaking and reinterpreting itself. The artist herself speaks of how the moment when she finishes a piece represents a certain moment of perfection in her eyes, and of how an inevitable decay or disintegration sets in from that moment on—which fascinates her just as much as that single ideal moment. I would add to this reflection the logical corollary that when she makes an exhibition, what she is exhibiting is above this process of decrepitude. Another way to put it—at least if you accept the contention that for Black, as for Bourgeois and for that matter even more so, ‘sculpture is the body’—would be to say that she is exhibiting the process of aging. Except why in the world would a 35-year-old woman be so invested in the idea of aging, which she herself has hardly experienced in the flesh? Presumably, these sculptures are not self-representations, however oblique. I have to admit that I was puzzled when Black told me that she is fascinated by Kleinian psychoanalysis, and that her thinking about sculpture is permeated with this fascination. Unlike the disclosure that her work is influenced by that of classic American post-minimal and antiform artists like Robert Morris and Robert Smithson—no shock there—I didn’t at first know what to do with this information. After all, there are no legible symbols of the unconscious here—nothing that most analysts would recognize as symbols at all, in fact. But what distinguishes Melanie Klein and the school of psychoanalysis that she founded from Freud and most of his followers, whom she nonetheless influenced in turn, is that she based her account of child psychology and development, not on a reconstruction from clinical experience with adults but on direct contact with children. For Black—as she told an interviewer at the time of her 2006 exhibition at Outpost, Norwich, ‘Freudian analysis was based in language and revolved around the father as the central figure’ whereas Klein’s concepts ‘were based in play and in a more physical relationship with the world rather than a cerebral, linguistic one, with the mother as the central figure’. If sculpture is the body, one is always entitled to ask, ‘Whose body?’ In Black’s case, it seems, it is not—despite her interest in incorporating into her sculpture, substances she uses herself for her own self-care—an autobiographical or narcissistic body, but rather a maternal one. All the more impressive, then, is the fact that she has exercised the “formal understatement” Lippard called for in order to bypass all the “literary pictorial associations” that for centuries have clustered around the stereotypical imagery of both the good and the bad mother, and even the good-enough one. Black’s work has been praised—for instance in a review by Isla Leaver-Yap in Issue 9 of MAP —for its surprising maturity, and rightly so. Wouldn’t it make sense if this sense of maturity were grounded, not in the self-regarding myth of the young artist that has become so ubiquitously the topic of recent art, but in the pathos of conflicted love, desire and memory that permeates an adult’s tangible engagement with her feelings toward the maternal?